Use the "Day Background" command on the Edit menu. Right-click the Month View and select the "Day Background -> Color" or "Day Background -> Picture" command from the popup menu. Click the Day Background box on the Appearance tab of the Event Editor, and then click the "Color" or "Picture" command. VueMinder provides the ability to specify background colors or images for dates in the Month view. After selecting an image, it will appear on the date in the Month view, automatically scaling and/or cropping itself to achieve the best fit. 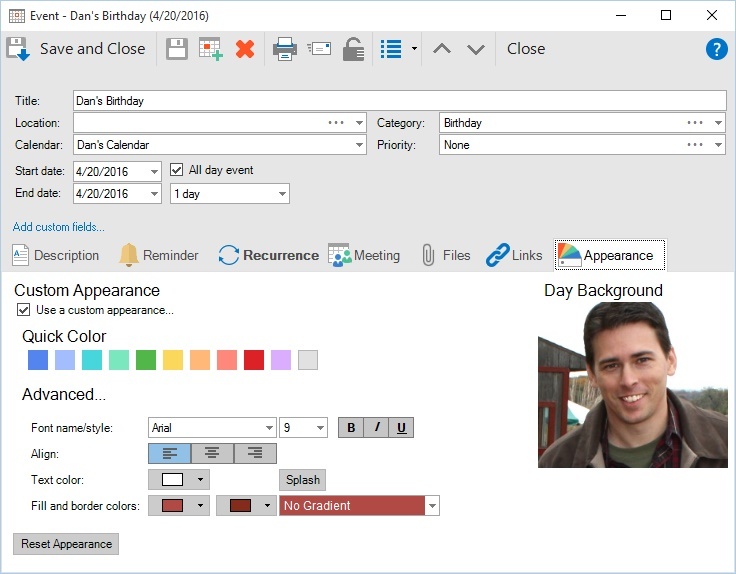 Date backgrounds will also be included when printing or when saving the calendar to an HTML webpage. Date background colors or images can also be linked to events. For recurring events, the background will appear for each occurrence of the event. If the event is rescheduled to a different date, its linked background image will automatically follow. VueMinder even handles the case where multiple events on a single date each have a background. Whichever event is clicked last will have its background shown on the date. 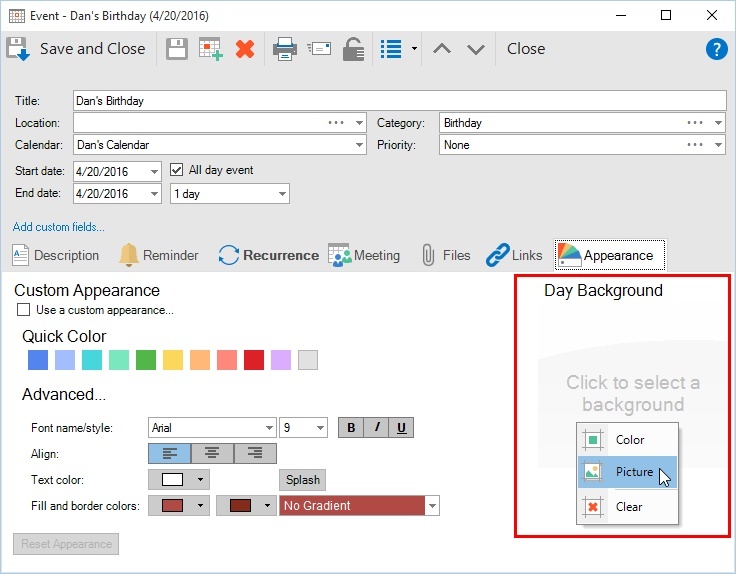 The Month view's right-click menu includes a "Day Background" submenu, which provides options for setting a background color or image on the selected date(s). A command is also provided for clearing any existing backgrounds. These commands are also available on the Edit menu. Pictures from a local drive or network can be inserted into selected dates of the calendar. To insert a picture, select and right-click the desired date(s). From the popup menu, click "Day Background -> Picture". A window will appear enabling selection of the desired picture(s), which can be located on a local hard drive or network folder. The picture will be automatically scaled and/or cropped to fit the date rectangle. As the window or Month view is resized, the date background will automatically adjust for the best appearance. 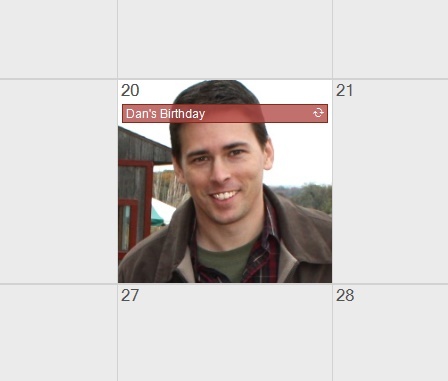 This feature is excellent for family calendars. For example, a person's picture could be added to their birthday. Online images can be can also be inserted into selected dates of the calendar. These images are linked to an image address (URL) on the internet. To insert an image from a URL, select and right-click the desired date(s). From the popup menu, click "Day Background -> Image URL". A window will appear where an image URL can be entered. 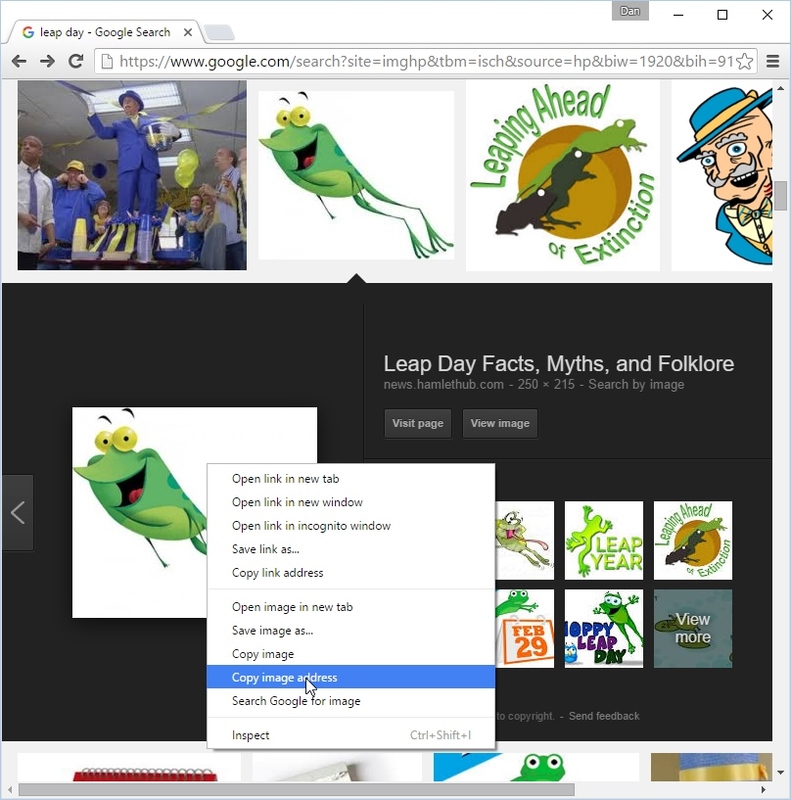 For best results, use the context menu in your web browser to copy the image's address. The image URL must end with an image type, such as ".png", ".jpg", or ".bmp". Also, images that are on websites requiring a login (such as Facebook) can't be added directly, for security reasons. 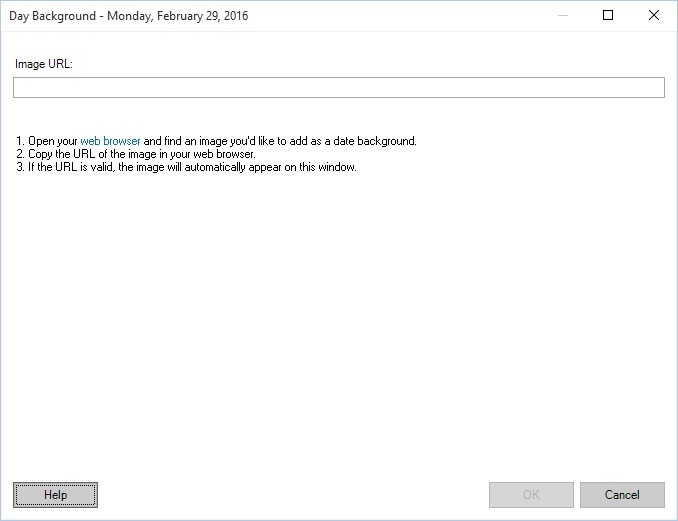 After a valid image URL has been entered, the Day Background window will show a preview of the background image. To finish adding the background image, click the OK button. The image will be automatically scaled and/or cropped to fit the date rectangle. As the window or Month view is resized, the date background will automatically adjust for the best appearance. The image will also be downloaded and cached, so it will continue to be displayed even when an internet connection isn't available. A solid background color can be specified for a selected date. 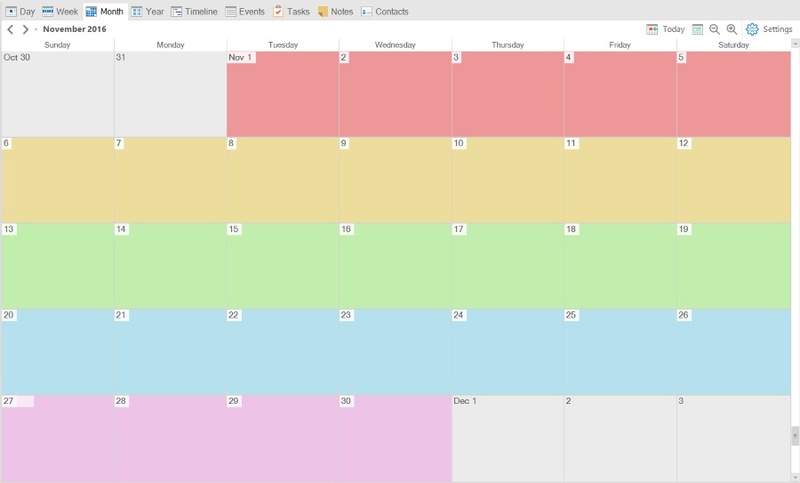 When multiple dates are selected, the background color will be applied to all the selected dates. To select multiple dates, click an empty area in a date and then drag the mouse to highlight the desired date range. After picking the date(s), right-click and select the "Day Background -> Color" command. 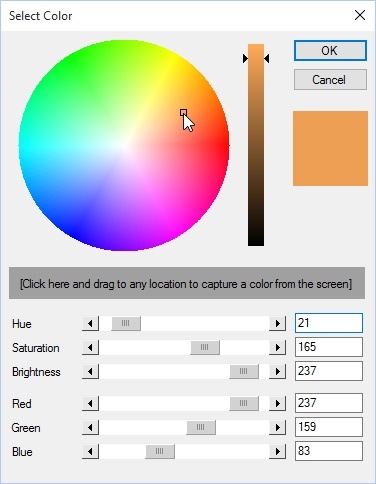 The color can be selected using a color-wheel. Drag the square to the desired hue/saturation on the color wheel, and then use the slider to the right of wheel to adjust the color brightness. This feature could be used for coloring an entire month, certain weeks of the month, or a single date that has special significance. In the example below, each week in November was colored differently. To remove previously specified day backgrounds, right-click the date and select "Day Background -> Clear". This will also work for multiple selected dates. All colors and images will be removed. Day backgrounds can be linked to events. This is especially useful for events that recur (like birthdays) or events that are frequently rescheduled. The background will appear for each occurrence of the event and moving the event will cause the linked background to move along with it. 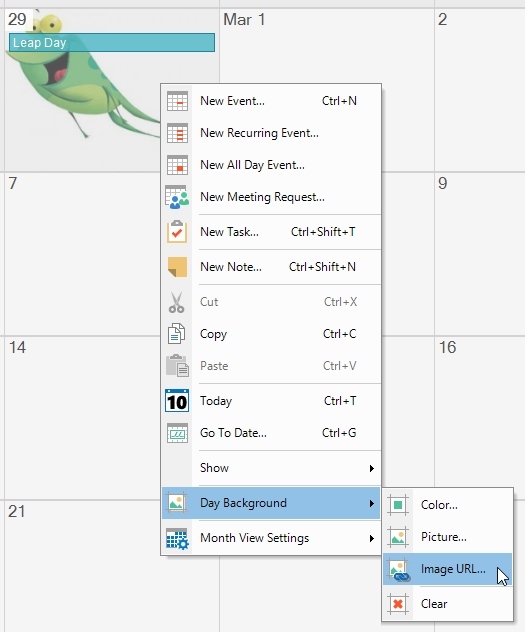 To link a day background with an event, open the Event Editor and click the Appearance tab. A "Day Background" box will show the current background for the event, or an empty box if there's no background yet. When clicking the box, a menu will appear with the same commands seen when right-clicking dates in the Month view. The options available in this menu work the same as those described above. The event can have a solid color or image. After selecting a background, it will appear in the Day Background box. After the event is saved, the image will appear in the Month view. If multiple events occur on the same day and each have a background, the Month view will update to show the background associated with the most recently clicked event. Each event on the date can be clicked to see its background. Event backgrounds also override backgrounds specified via the Month view's right-click menu. When events are filtered using the checkboxes in the Calendar Items area of the main window, their backgrounds will also be filtered. Day backgrounds will also appear when printing the Monthly layout or when saving to a web page. The backgrounds will match those currently shown in the Month view, although the backgrounds may be scaled or cropped differently to achieve the best fit. 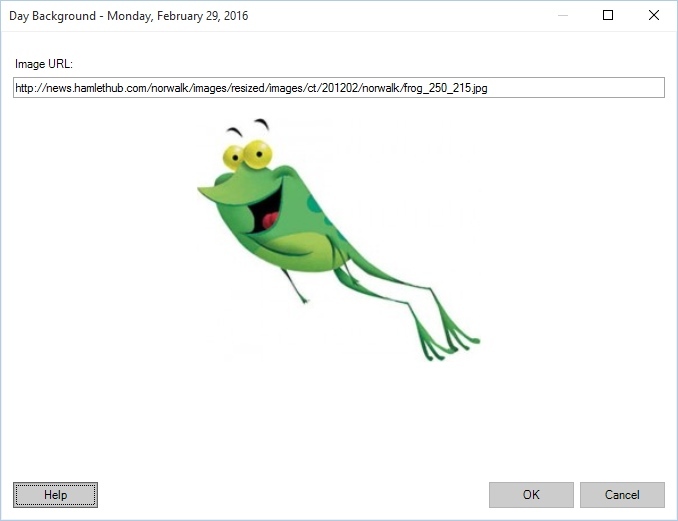 When sharing over a local network, day backgrounds associated with events will appear on other computers as long as any images are added from a URL or located in shared folders on the network and not local/private folders. Event backgrounds are also published to ICS files and synced through Google Calendar, although the backgrounds won't appear on the Google Calendar web page. Note, the pictures are not embedded in the actual calendar data because this would drastically increase the amount of data that needs to be transmitted, increasing the time required to sync.